“Mad Hatter: “Why is a raven like a writing-desk?” “Have you guessed the riddle yet?” the Hatter said, turning to Alice again. He always was a little...strange. After all Mad is his middle...no first name! (which we're sure carries much more weight.) It's one thing to be mad though, at least he's a little cheerful then. Now the Mad Hatter himself has taken a bit more of a lonely path down the road to madness. It's a little less colorful and a lot more bleak. One could say he's taken a sort of a dark turn. He likes his tea without sugar now and his laughs are a little more diabolical than anything. His riddles have a bit more of a deadly punchline even if you get it right. Alice better be a little more careful next time she comes back. Wonderland is taking a turn for the worse. Before long it might have to change its name to fit the mood. 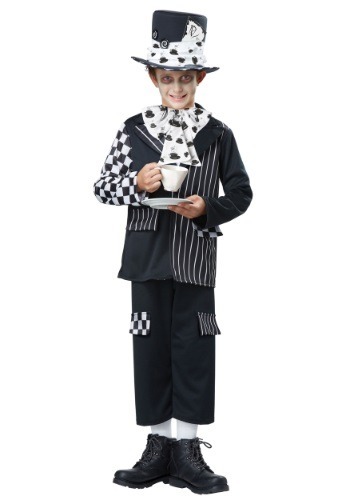 Leave your friends a little uneasy around your child this Halloween with the Dark Mad Hatter Costume. All he'll have to do is find a nice little tea cup and slap on a bit of a silly grin (not quite like Cheshire cat's though) and perplex your friends with the strangest behaviors that you won't even understand. It's all an unpredictable world of madness when you fall into the rabbit hole. This is a great group costume. We have plenty of the other characters here too! !